This predatory fish nearly went extinct due to overfishing in a very short amount of time beginning in the 1970s. It is slowly recovering. This predator consumes large prey, but a big portion of its diet is made up of crabs. The goliath grouper catches fish and small sharks by ambushing them. Most prey is simply engulfed with a snap of the jaws and swallowed whole. The goliath grouper—the largest species of grouper—is found in tropical and subtropical waters of the Atlantic Ocean from North Carolina to Brazil, and throughout the Caribbean and Gulf of Mexico. 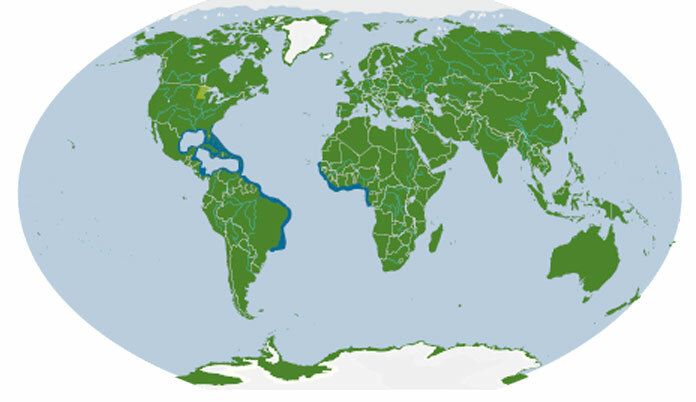 They are also found along the east coast of Africa from Senegal to Congo. As juveniles, they live in estuaries and mangrove swamps close to shore. Adults move farther off shore and prefer the sheltered habitats of coral reefs, and especially shady areas such as shipwrecks, rock ledges, and caves. Goliath groupers grow and reproduce very slowly, and if they survive, they can reach enormous size. Large adults don’t travel much and instead defend a territory to keep to themselves unless they’re spawning. Overfishing of goliath grouper in the 1970s and ‘80s caused a population crash. They are considered critically endangered. Since 1990, catching them in the U.S. has been illegal. Their slow growth rate means it may take a long time for them to recover. Tarpon are found in tropical and temperate waters along the eastern Atlantic coasts of North and South America. They have large silver scales – up to 3 inches in diameter. These large fish may grow up to 8 feet in length and weight up to 350 pounds. A female tarpon may lay 12 million eggs, which drift in ocean currents far from shore. Like many ambush predators, tarpons have an upturned mouth for striking predators that pass above them. They typically feed on crabs, mullets, and marine catfish. When swimming in oxygen-poor water, tarpons can gulp air from the surface using special lung-like bladders. Hatchlings are larval, almost transparent, and look more like a clear strip of ribbon than a fish. Initially the young head to shallow water where they become an intricate part of the plankton that drifts with ocean currents far from shore. When they reach 1 inch in length they metamorphose into tiny versions of their parents. Most mature goliath groupers can get to be 400 pounds, but some giants have tipped the scales at over 700 pounds and 8 feet in length! When threatened, an Atlantic goliath grouper will defend its territory with aggressive body language and a distinctly audible rumbling sound. The sound is produced by contracting the swim bladder and can travel great distances underwater. It’s thought that the sound can also be used to communicate with other goliath groupers. During the breeding season, goliath groupers gather together at breeding sites. This communal spawning behavior makes them further vulnerable to harvest. This species is critically endangered because of overfishing. 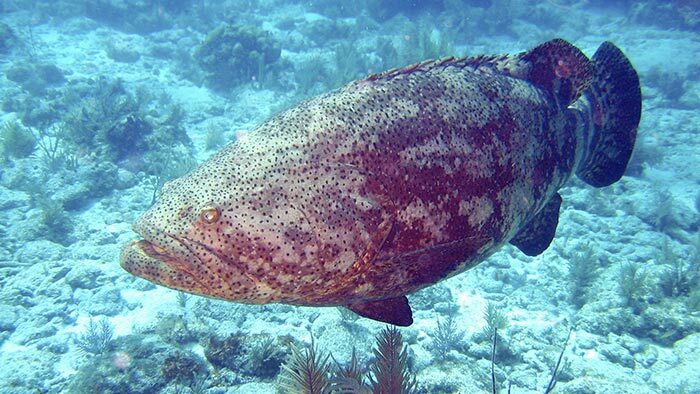 Atlantic goliath grouper are especially vulnerable to overfishing because of their large size, slow growth rate and maturity, and group spawning activity. A fishing ban was placed on the species in the federal waters of the southeastern United States in 1990 and numbers have slowly increased in the Florida Keys. Conservation efforts to help save the Atlantic goliath grouper involve promoting mangrove protection and enforcing the fishing ban. You can help ensure that species are not overfished by using a Seafood Watch guide or phone app to make smart seafood choices. These guides show you which seafood items are good choices to purchase because they are either wild caught in a way that does not cause harm to the environment or are farm raised in a sustainable manner.